Saw your comment only yesterday and couldn’t get around it to comment. Apologies for the belated reply. In the early 90s, the pitch that pervaded the zeitgeist of the day was to make Eritrea the “Singapore of Africa.” If a cookie cutter could cut them all, the narrative couldn’t have been perfect for Eritrea had all the ingredients Singapore had only for a minor difference with in their respective historical trajectories. As you may know, right after World War II, Singapore was made to be part of Malaysia but in the early 60s, major differences started to come to the fore between Malaysia-proper and Singapore. And instead of Singapore demanding for independence, the Malaysian parliament overwhelmingly voted to kick Singapore out of the union. It was similar to what you are fond of saying, Ethiopia got her independence from Eritrea instead. But to a complete surprise of everyone, Singapore with in a single generation got transformed from a third rate country to a first rate country. In every conceivable index of the UN, it has been shining for the last three decades or so. One of every six Singaporean is a millionaire in US dollars among other things. Eritrea on the other hand opted rightly so to secede from “backward” Ethiopia when with in the Ethiopian elites, the motto as the Romans had it was “Mare Nostrum.” In the end, however, what happened instead was Alan Dershowitz’s famous court case where later on made into a movie titled, “Reversal of Fortune.” Eritrea under Isaias was reduced into a nation what it is today. The world knew about Ethiopian a country of very proud people who stood strong against Italian invasion where the stunning victory shattered the myth of Eugenics in the Sciences and brought Africa which was once bubbed “The Dark Continent” by European literati as in Joseph Conrad to a pedestal of power to reckon with. The once proud people however, fell onto a rough time when a military junta rode the mantle of power and destroyed a generation of promises and hopes. In the meantime, heaven diminished the nation through protracted famine when children dropped like flies. It was with in this grim and dire backdrop that the nation found her silver lining when the junta was defeated square and over and the nation once again rose from the ashes. Twenty years on, the narrative changed when Ethiopia owned the world stage in economic success, diplomacy and military as well where the dying poster child was no more. The reversal of fortune happened precisely because a selfless generation gave it all so that the nation can stand strong one more time as it did in 1896. It was Menilik back then and it was Meles one hundred years later. It remains to be up to you either to keep the legacy for history doesn’t bend in your favour if you opt to stand against it. At the end of the day, it is a matter of choice. Just I want to say to you “well put and well said”. I can’t agree more. But, but, as you know…….? This is a magnificent Paul-grade history. But you went too fast on Meles’s dirt while trying to wash it with IA’s dirt. Meles tried to kick Eritrea out, but deliberately left chains of regret in various forms. Menelik did really kick Eritrea out because he had ‘bigger land or lake fish to fry’ and as the result, Eritrea ended becoming Singapore before Singapore albeit at foreigners hand leaving its people in serfdom. One hundred years later Meles tried to do the same. He went also south, but couldn’t keep his new acquisition intact. He needed a glue that brings together the ethnic fiefdoms he created and a medal of honor and trust for himself. He wanted to do more than Menelik in marching to the north as well. An easy thing to do for a war-hardened guy like him. He found his glue in the name of Eritrea and used the unsevered chains he deliberately left intact before kicking out his head-ache. Thank you for those kind words. Menilik and Meles certainly lived in times of their own where the challenges presented to them stood in a sharp contrast to each other but one can make the argument that their personal ambition got in their way and may have clouded their over all vision. When we get into details and assess their contribution at a micro level if you will, we stumble upon the vicious animal in them and it becomes problematic for us to see the greater picture. My intention was to bring to light their respective legacy particularly Meles’ for the country he led was in a far more better shape when he left in comparison when he first assumed power. Sure Ethiopia was better when he left than when he arrived. Depending on the criteria we use to compare, Ethiopia was better when Mengistu left compared to when he arrived. I will leave the appreciation of the greater picture to Ethiopians to see. What I see is the greater malicious design he had to bring our country to stone-age and mayhem, of course incompetently helped by our own. If he didn’t have a greater negative impact on our country, there was no reason I talk about him here. It is going to be one of those too familiar ኾለል of arguments here in this Forum. I guess it is a matter of perspective and we should leave it to time to be the judge. If not, the usual suspects will start hurling Weyane this and Weyane that and the whole discussion not only becomes a total turn off devoid of a substance but a stinking stale as well. I enjoy your inputs and respect your sense of civility as well and wish others could follow your manner of engagement before the Forum loses its luster and coolness. How would you feel about the PFDJ advising you on how to oppose it? Would the devil be qualified to advise you and how to become a pious person? Would a killer be qualified to lecture you about the sanctity of life? Is a jailer qualified to tell you about the importance of freedom? 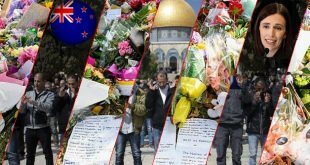 Is a belligrabt renine be qualified to preach about peace? I believe there is only a yes or no answer to my questiins depending on the perspectives. That’s is the reason for the kolel that you observe in all the region’s discussions, mainly Eritrean discussiobs. What do you think? In my humble opinion TPLF will never protect Eritreans interests and the last 20 years taught us where their heart lies. The reason they are trying their best at this time is because they are cornered in Ethiopia. Majority of Eritreans will never forgive or forget what TPLF did to Eritrea and Eritreans in the last 20 years. You apologize for me is an insult because I dont know even what you have listened. I ignored the link Berhe pasted because he is a tplf sympathizer. I just ignored his comment but yours needed a reply. Hi Abi; the people you mention are Agazaian at heart. they may tell you Eritrea is Ethiopia that but deep inside they are Agazians. meaning the people of Tigray, excluding Ethiopian people and Eritreans, excluding lowlanders of Eritreans. So, that is where they are. why do you think they hate PMAA? the man all he preaches is unity, peace and forgiveness; well his plan for peace between Ethiopian and Eritrea kills the idea of Agazian. this is the real reason why the people you mention hate PMAA. Hi Abi, you see you are not an objective person. First you try to be funny with your phony jokes. Once some people enjoyed your silly jokes you tried to build credibility through your silly jokes. In reality you are stuck with feudal mind. If people disagree with your opnion you call them Tplf supporters. In your view of the world if you agree with the fake ras Abi you will be baptized with knowledge and wisedom. If you challenge fake ras Abi you are a Tplf. Do you know that we are in the 21st century? It seems to me that you couldnt be a real dictator in real life and you are trying to be a dictator in awate.com forum. Abi, if you like to enjoy black racist and feudal war lords, you need to stick to your ESAT fake news. Awate.com, is the home of divergent view points. The home of creative ideas and debates. Abi before Eritreans knew your real nature they tried to reason with you. However, I new you from day one that you are feudal era fake ras stuck in the 21 century. You lack sensitivity toward people who are suffering. Most of your comments were sneaky and hateful. I was always suprised by those who laughed at your jokes. You are here not to provide solution but to annoy and get attention. 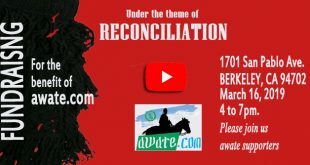 While awate.com symbolizes hope, change and future, you are a symbol of the feudal dark ages. You are truly a museum of the dark ages. All of us have to work hard to make sure that feudals like Abi remain phony, silly, comedians living abroad at the good will of his Mezungu bosses. Dear Ras Abi I hope that answered part of your question. I guess he gave you answer, no aswer. Now you see why we dont have opposition. They are just TPLF masquerading as Eritreans. He doesnt know how Eritreans protected themselves from this woyane virus. The crime they have done based on ethnicity is beyond word can comprehend in our region. Imagine if instead of Abiy one creasy uneducated Mengistu Hailmariam caliber takes power in Ethiopia. Can you imagine what could have had happend with mob justice against Tigrians. I dont understand how these losers think. Ethiopia sustained such inhuman brutality from Woyanes just because Tigrians number is only 5 million and compared to 100 millions couldnt do what they have planned the way they wanted. Not only that the problem with ethnic politics is instead of regretting what they have done they feel it is injustice to send criminals to prison just because it could be one of theirs. I got support group who put your beloved looters in handcuffs. What is ESAT? A new syndrome for bishop Debretsion and his supporters or what? I love to see tplf humiliated specially in this forum. I want you to work hard how you justify what tplf has done against Eritreans and Ethiopians. Pls forget this chameleon weyane internet cadre lousy day. He is here to defend weyane . You know in the weyane land it is possible to be a priest as well as a Vice President of Tigray just like Debrestion. Debrestion tried everything to make the religious holiday in Axum to be a political day . He invited Eritreans to come to Tigray and work there and then rope them after a while . He didn’t even say sorry to the crime he committed over Eritreans. He didn’t even asked Eritreans to take their property from his weyane luckies in Mekele , adigrat and many Tigray region . Tplf doesnt need motivation. The virus is loosing its natural host. It has to come to Eritrea or die. Do the math. Rass Abi; as promised; here we deliver. Eritreans never go back from their words. The rest will be delivered accordingly. The helicopters being painted, polished and serviced for your convenient. in case you guys run out of handcuffs, we include few hundreds of them. How about the second part of Isaias’ interview? It was promised to be delivered to the Eritrean people. Was it not? Hey P; you are right but due to extraordinary events around the horn Africa; Eritrea elected to postponed the second interview of PIA. On this interview the freedom of all political prisoners will be announced and the road map of the future of the nation shall be drowned. For instance, the establishment of free press and its press rules; constitution and election, the end of endless national military service etc . So the reason for delay is just to make it especial for the New Year with a new beginning for the people and nation of Eritrea! With the kind of good hope that you expire, you reminded me of a hopeful childhood story that I forgot and hope Abrehet to come and tell us (where are you, Abrehet, my saviour). It was about a poor mother who tells her children about how plentiful will be their table (መኣዲ) next year. Here is my side of that story. ክንወጽእ ኢና ዝወደይ ካብ ዘለናዮ ዓለቕቲ. Now I know who you are or might be. Speaking of Gen Nittric’s prediction or hope,rumors have it that some thing serious is cooking up . Interesting that an Ethiopian Evangelist has predicted/prophesied as such. ‘god is showing me and telling me that something SERIOUS will happen in Eritrea vert soon and let us PRAY hard and day and night that some thing very good will happen”. Now,this could be a fake prophesy but as a Christian Faithful,I do believe inf prophesy. I really hope that will be the case for the delay. To hope is human and we can’t afford to lose it. God bless! 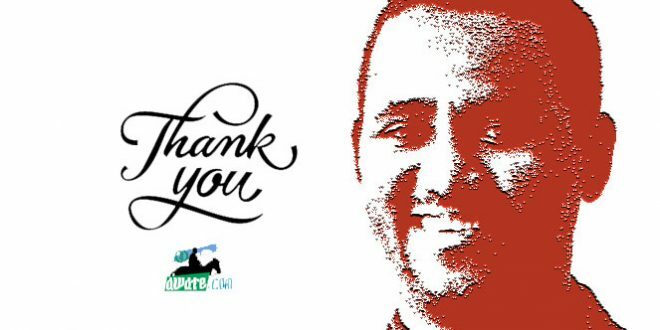 2) Not only that–you must have been perplexed about what this guy (pmaaa) had done sofar in Ethiopia. 2.1) 60 years long (hostage) held political reform was inherently done in 6 months. Waw. Can that be replicated in Eri. Be honest. Let us come back again to Hawan, the debris camel that grazes at Weyane pastures. It should be understood by now that Weyane is dead when Dr. Meddamar arrived a way back before the Edaga Skunis Capo declares the game is over. It is true Weyane/TPLF is dead and will never reappear in the Ethiopian scene for the next 100 years. The tyrant has used Weyane as a bugaboo to divert apologists from his destructive primitive programs, and to lead Eritrea to its present wretched situation. The crazy despot succeeded in gathering around him many insane guys that implicated entire supporters with his malady. Many of the insane guys suffer from inferiority complex, from field researches. They get in Isaias a hero that he achieved in the struggle for independence. Their memory registered that remote event and ceased to function any more. They are often in search of winning a game to go frenzy. They usually prefer to attack the weak that gives them an easy success. If it happens that a strong foe fell down, it is a feast for decades to come. They think the dead foe will come again to life. This is the reason that makes them graze in corpse and feel rejoiced. They utilize the location of the fallen enemy as a pasture land in which they graze and entertain until their Capo finds them a new fresh location. Likewise, many of the supporters are phonies whose loyalty is to their mother land Ethiopia. They are the same like Isaias who visited his grandfather grave in Gonder and sworn to Sacrifice his life for his motherland Ethiopia. This clearly teaches us being borne and spoke the language of certain country doesn’t make a certain person a true nationalist. Now let me ascend to Biyassa Skunis Capo. Dr. Meddamar feels coy when he is asked about human rights in Eritrea. He eludes by saying it is an Eritrean internal issue and should be solved internally. He forgets that he has opened the doors of Ethiopia widely for Isaias to graze freely inside Ethiopia and become more frenzy inside Eritrea. The Eritrean people never consent Isaias to interfere in Ethiopian issues, at the same time they never allow Ethiopia to indulge in the Eritrean affairs. Dr. Meddamar has permitted himself to build NAVAL BASE in Eritrea at the time he refrains to speak about human rights situation in Eritrea. This makes Dr. Meddamar a hypocrite and deceitful guy who intends to make positive changes in the Horn of Africa and build a democratic and civilized Ethiopia. Dr. Meddamar should abide by demarcating the border and stop all projects he is active in. He should conceive it well that Isaias does’t represent the Eritrean people. He is a man accused of CRIMES AGAINST HUMANITY by the international community. From now on Dr. Meddamar is considered a collaborator in the crimes against humanity in Eritrea. Thanks for your 27 years cursing woyane because your cursing killed woyane for ever. I am still confused how your cursing has no effect on Eritrea. The people of Eritrea has no pie in the death of Weyane. If there are some phonies, who use Eritrean identity, collaborated in killing them it is not the problem of Eritreans. The case from A to Z is an Ethiopian issue, and Weyane knows that perfectly. You can contact them. It is a good notice from your side how our curse has no effect on Eritrea. The reason is very simple and clear. Pythons presented themselves as Eritreans and beguiled the Eritrean people. Now you are requested to pull your hands from interfering in our affairs, and we will deal with the pythons. If your memory aids you, we don’t just curse, we take action too. Back to your cursing. See you after 27 years and we will see what your cursing brings about. Peoples are AGE NEUTRAL. They are not like individuals with a limited age. This is not the first time the people of Eritrea stand at a crossroad, in 1960 the same happened when Haile Selase annexed Eritrea to Ethiopia without the consent of the Eritrean people. I would like to remind you that Haile Selase held festivals in all the cities of Eritrea on the occasion of Meddamar. The issue of Meddamar is not a brand new event for Eritreans. It is up to you to celebrate with Dr. Meddamar with your new discovery, but for Eritrean it is an old story. I am also celebrating with the Eritreans who celebrate the peace. My understanding of reality couldnt allow me how any Eritreans or Ethiopians twist the peace made by two nations to something ugly except tplf. Tplfites have enough reason and i understand very well. How many times do you want people to repeat, Ethiopia problems, including TPLF are Ethiopia’s concern. The problem with you is, you want us to celebrate Isayas Afeworki, while are celebrating Abiy. When we tell you, there is nothing Eritreans needs to celebrate because our problems are still happening but you label as TPLF, or part time opposition. I saw this video on FB today. Please spend sometime to watch it. How do you expect us to celebrate with this type of story. If you see their cry and emotions and you feel nothing, I feel sorry for you. The devil has possessed you. You have no humanity left in you. Just because i dont agree with what tplf is doing? I dont get you. I agree with you Eritreans were overjoyed after the agreement between the two countries for peace in July. In the city I live currently, Eritreans and Ethiopians decided to spend together to celebrate new year eve. Once the cancer TPLF is removed from power there is peace in the region. Dishonourable deal, will not last very long. I see him tormenting, with the letter of warning. I am the ADMIRAL, keep your hands off my pocket! Thank you for sharing. I am assuming this is Sudanese group singing. The meledy does remind me Tilahun Gessese song, I forgot the title. Is that it? Beautifully done. BTW, I don’t understand your comment. My comment is referring to the indecent proposal, among the sultans of the middle east, Ethiopia, and Eritrea without putting into consideration the interest of the actual people of the red sea. They are pocketing billions of dollar each by selling something that doesn’t belongs to them( the red sea). The transaction and the deal that buyers made is an ethical and dishonourable. The Admiral of the redsea, strongly reject the deal that doesn’t benefit the people of the red sea. If you want to beat a snake, you have to go for the head not the tail. Never enjoyed music like this. This is how the weekend should be started! The people are beautiful and elegant! Music at its finest!!!! Tilahun Gessesse should be smiling . This is how you honor a great singer. Dear Hameed Al-Arabi, yeah, what we as Eritreans first and foremost demand from Dr. Medemer is that he proceeds ahead and implements the border demarcation as he pledged, i.e. acceptance of the Algiers Agreement and border ruling without preconditions. Do you demand also that the PM calls Pfdj and all its oppositions in the current meeting? There is no limit for cyber Eritreans so called justice seekers. Hi MM, please keep your lousy internal politics for yourself; we don’t want to complicate the problem, we have already enough of our mess. I’m talking about humanity not politics. I thought you were demanding Ethiopian PM. Or are you confusing him for your opposition chairman? Or do you demand that he restart changing the government of Eritrea project so that you can continue to empty Eritrea its own people? You see a lousy hypocrites have no limit in their demand. Please join me nominating His Excellency PMAA awatista of the year!! Selam Abi, I think the most fitting would be naming him the hypocrite of the year. His fake humanity has been long exposed; Hayat Adem was indeed right about him. protecting ethiopia’s national interest is number one duty of 3A gov(any gov). 3A got olf, onlf, gambela lf, benshangul lf and so many other so called liberation fronts under 3A jurisdiction now, they all r in ethiopia now, that is the real meaning of 3A “medemer” diplomacy. if u take economic activity of the horn into consideration, economic integration,port, bla bla r secondary, very miner or it doesn’t change anything for ethiopia interest. but i can assure u the border will be demarcated according to Algiers agreement. The PMAA hypocrisy hit a new high when he made a joke about the three African dictators during his meeting with the oppositions few days ago. You know that goes like, one African dictator saying we have election but no competition, the other asked “what is competition” and the last dictator asked “what is election?”. 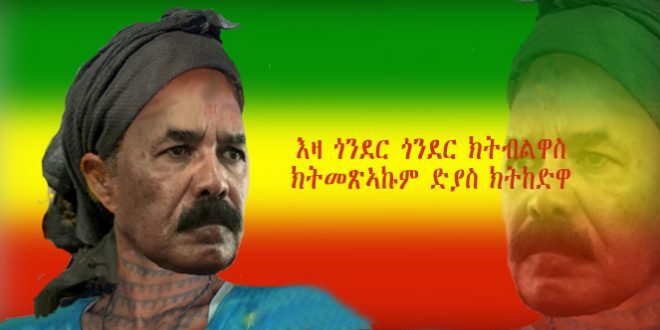 If Abiy could do that with Isaias accent, it would have been a real practical joke. Hi Kaddis; it took me long time but I have come to understand where you stand. Your TPLFsim is on full display. Having said that; PMAA has no say on what is going in Eritrea and he has right to suggest anything at all. there is a border agreement and let’s do that and that is that. I don’t how to tell you but neither your country nor your leader is allowed to muddle in Eritrea’s internal afire. A good man knows his limitation and PMAA knows his. In the mean time my condolence to you for your loss of TPLF thugs. Kaddis has been always a TPLF guy , the few critic he throw to weyane has been to lure some people but I known him long time ago is just as equals of T. Kifle and Eyob . Remember one day I asked him about a news media of Bereket Simon (ENN) he said “ they are excellent at analyzing politics of the region and Ethiopia “ from that day I concluded he was a weyane guy . You have to understand also it takes ages to find the real weyane intention just as it is decades to know weyane evil deeds . They are up on arms to disqualify the PM ( Abiy) but we know them deep in detail that they are thieves. If I may allowed to gossip for one day, I would say Kaddis is in Mekele away from his looted vila given by weyane in the Lexus of addis . Hey Blink; no doubt he is a TPLF sympathizer if not full blooded TPLF goon. You got to give it to him though. he is smooth as they come. When the bomb went off in Addis in attempt to kill PMAA; many of us rightly blamed TPLF thugs and Kaddis shows up and said ” what if somebody other than TPLF did it knowing TPLF will be implicated” I was sold by his reasoning not knowing he was just defending TPLF thugs. And again When PMAA and PIA inaugurated the new sugar plant. Kaddis said ” we were told the budget for the sugar plant was looted by TPLF but here today the sugar plant is opened” now look how is defending the thieves; the fact is the money for the sugar plant was looted but the government of Ethiopia took 6 billion birr loan from china to complete the plant. Do you think Kaddis doesn’t know this yet he has the audacity to make such ignorance comment. Anyway no one can do to save the TPLF now. TPLF is dead for good!!!! there is nothing kaddis can do. Hi All; I hate to break the bad news for the likes of Berhe and Semere E but, when your master PIA said game over you should have trusted him. The End of TPLF as we know it is over and done. Your arguments are so naive and superficial,let alone to be substantiated. Your Conspiracy theories are way worse than a pathological paranoia,albeit a Classic PFDJ’s Treacherous Propaganda Manual effect,that I am fully aware of,that I have been there and have done thing. I understand your argument,which is a basic common sense but we are NOT asking for an overnight unplanned and immediate changes but a step-wise incremental Policy Modifications and changes starting from the basics. -Allowing a “REGULATED” Freedom of movement until the dust settles down completely to be followed by Full Blown Movement in a way that will will not compromise our national security-keeping an eye on the dying TPLF left-over Spy Agents and the Chauvinists with their hidden agenda. The above positive measure,NOT only DO NOT affect negatively our National Security Interest but rather,contrary to your assertion and paranoia,will rather improve and strengthen our National Security Interest and Unity thereby expedite the positive change we have longed for.As a matter of fact,lack of the above measures has worsened our problems and jeopardized our unity and National Security Interest and Economic Progress,which you know very well. He is like…musilm and Christian..oromo and amhara…speaks tigrigna…His PHD is conflict management. I mean how can anybody believe this guy just showed up out of nowhere…vwry weird. Indeed,may God save us from the PFDJ and its Apologists. ” I hope i am wrong but the first thing Ethiopia prime minister did was a military pacts with Sudan and Djibouti i think Kenya too. I always wondered what is that about. Could it be that if something happens in Eritrea all these countries, under the covers of humanitarian crisis all four countries can invade Eritrea with the blessing of IGAD and AU”. Why are you asking me a question that you know the answer for? Haven’t we agreed that the entire agenda was to destroy Eritrea and Eritreans by all means possible? Isn’t the whole purpose of Eritrea’s multi-faceted “war Front” to pay back in KIND to that Janda and its mercenaries,which we have succeeded almost close to a 100 %? Hence,we are asking for a NEW ERA of peace,development,freedom and Constitutional Governance. It was your President,who assigned ‘my PM” to be your FM and PM,which is a BETRAYAL and Treason at its best,if what your President said was what he really meant.It is your President,who totally ignored and made Eritreans DOWN when we expected him to make us HIGH in all aspects a Sadist’s Classic modus operandi and known cultist culture. Haven’t you seen a well proven pattern of such a sadist and cultist culture for the last 20 yrs,where that Sadist and Cultist “Leader’ has been using this pattern by promising us one thing during his initial interviews but then ONLY to break his promise and make us DOWN,again and again? This is for the sake of arguing with you and to try to straighten few facts,not coz a certain George of the Cyber Space deserves an argument or feedback coz that Ghost called George has no clue about the PFDJ modus operandi and cannot be more Catholic than the Pope. No worries about “my PM” as he has proven to be a real Leader,a Uniter,a Charismatic and Principled Leader,who has saved Ethiopia and Ethiopians by all standard and has placed back Ethiopia to its rightful spot in just 6 months,based on his actions and facts on the ground and as witnessed by all World Leaders and the International Community/World. You should rather worry about your President,who has made Eritreans down…..
Hi Abi. Problems on the border were occurring at least 2 years before the eventful day of May 6, 1998. Meetings had taken place in Shire in 1997, at an old place called the Habte Hotel, in an attempt to resolve matters. Meetings which took place in Addis Ababa during the month of May 1998, especially those between the 6th and the 13th, are a separate matter. On the side, I am off next week, on a long overdue trip, to beautiful Ethiopia to spend a few days in Bahir Dar. I am really looking forward to it! You know I like you:). Why don’t you TELUS more about the interworking of EPLF / PFDJ secret party. What happened there and what happened to those members? Hi George. I have no lost love for the TPLF, having bad blood with them dating back to 1997, and I will never ever forgive them for what they have since done to Eritrea and Eritreans. And, I can also never forgive the Eritrean opposition that has since that time sided with the TPLF; to me this is tantamount to treason. I was in Addis Ababa during the Ethiopian-Eritrean war. At a certain point in time, TPLF security were positioned in from of my residence 24 x 7 and they had assigned a TPLF security vehicle to follow every movement that I made. On several occasions, my vehicle was pulled over and they would completely tear out my upholstery in search of something that I never had. One day following the deportation of Girma Asmeron, I too would be given a 24-hour notice to leave the country. I was in a way lucky as they at least gave me warning that I was being deported whereas most Eritreans were simply being rounded up like cattle at the kebele level and deported without any notice whatsoever. Times have now changed and the TPLF are on the run and hiding while at the same time Eritreans these days are most welcomed to Ethiopia. Hello Hope, thanks for the detailed response about Tplf. As you mentioned in the discussion the Tplf and Eplf feud that lead to the Badme war has been discussed in the past. You and I read fierce debate about that. Hope in my opinion EPLF was,an amazing organization until 1991. It basically motivated Eritreans to contribute to the struggle. All Eritreans contributed to the struggle without any complaint. Even in EPLF leadership highly educated Eritreans volunteered and lead with courage and resilience. However, when victory was achieved EPLF top leaders start to turn their back on the Eritrean population. For example, instead of pursuing reconciliation they started hunting down their oppenents in Sudan and in Ethiopia . This was,one of the major sign of incompetence and lack of leadership of king Isayas. Then the Badme conflict erupted, when there might have been steps that could have been taken to avoid the conflict from both parties. Hope, remember the definition of a true leader is a leader that could evaluate the danger of his actions and inactions to his people. A leader is not one that forces children to carry gun so that it is convenient to oppress the rest of the population? Hope, and now you are telling me that the next assignment for your leader is to start another conflict with Tigray, so that Eritrea and Tigray could be the home of war and mass migration? You define that as sucess for Eritrea? You see Hope, I want peace and stability for our region. I have strong confidence on the good nature of a common Eritrean men and women. They are beautiful, hardworking and good spirited people. I am glad they are my neighbors. However, I will never develop confidence on King Isayas and his blind followers. You see Isayas followers carelessly labeling their fellow Eritreans traitors, I think that is a shame. Every Eritrean paid heavily and to be called a traitor for having a different opnion is the worst for of treason. For all the above reasons I think that king Isayas is an incompletant leader. I dont see him making good choices. He tends to be tempted toward self destructive actions. For the sake of peace, I hope the Eritrean people find a good leader. On our side, ofcourse we can use the skills of brilliant ,and effective leader. However , we will like that to be the decision of Tigreans. It is funny. You are accusing FishMilk to be a TPLFts while he has also labelling anyone who dares criticising IA as TPLF. It seems that he is now on the receiving end of his own medicine. Good riddance! 2) Hundred and thousand Ethiopians killed, went to prison, tortured, discriminated because they were not Tigrians, were not allowed to share what they know about tplf governments corruption, hatred d among ethnic groups legally preached and exercised by tplf to control wealth and power while making the other ethnic group out of power and control of the wealth of the nation And Tigray is part of Ethiopia but Tigrians have not come out to demonstrate sharing their landsmen suffer and unfair treatment by tplf. The above three points make Tigians odd with rest if not a head on collision. Hi All.. A change of gears is needed. We need to conceptualize/strategize practical ideas to promote reforms in Eritrea’s governance which do not place its citizens at risk. For example, something simple such a green shirt movement, wherein Eritreans inside Eritrea wear plain green shirts as a silent way to express their desire for the release of prisoners or to encourage government reforms can be considered. An interesting book to read in this regard is ‘From Dictatorship to Democracy’ which is known to have played a role in the Arab Spring movement and has often been compared to Karl Marx’s Communist Manifesto and Mao Tse Tung’s Little Red Book. It is based upon over 40 years of research and writings on nonviolent means to achieve regime reform/change and stresses that the best way to end a tyranny is for the people of the country to do it and not a neighboring or external force. Eritrea-Ethiopia borders are now open. Why not purchase thousands of copies and hand them to every Eritrean traveling out of Eritrea as some will be returning. Just for the record of entertaining your idea , do you ever ask yourself that these admirers of Meles Ethnic politics are man up to do such thing ? Ask yourself who were these ethnic politics champions? You can find them here by single view . 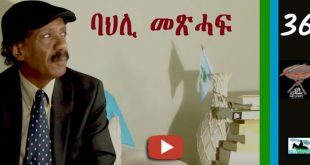 Do you think for a guy who spent a good time of his life advocating for the division of Eritreans across religion, ethnic and regional way is able to ask people to wear green T-shirt ? I don’t believe these guys are serious people about this . What they know is a for Qerenlos and what ever the others can say about Awate and other Eritrean heroes. Let’s take one extra guy who was a polytechnic student in Ethiopia and then joined ELF and worked his share to see him suddenly trash Eritrean founders and history makers for the sake of revenge? I think we need to realistic about this change thing . First and for most Eritreans across the board are tired of these ethnic political cadres , second these people know deep inside that their vision of dividing Eritrea across ethnic zones is Over , I repeat it is Over . There is no Kunama , Afar , agazian , Islamists , Al nahda or what ever their name that their dream of serving weyane wish is over . What they have to do now is leave the game and declare that their vision is over so that others who respect Eritreans history and unity can come in play toe to toe with PFDJ . I think I can say the new plan can only work if the people in the opposition camp ( not the registered 15 members so called party ) recogniz the Eritrean peoples wish and face the reality. We have seen many political prostitution and their propaganda but I have never seen any political difference that works to completely destroy their country. We have seen the yellow movement in the Eastern Europe and we have seen the movement of many but never do they work to destroy their country sovereignty. Our elite writers of weyane friends has been simply rubbish and blind folded about Eritrean public. The difference is in recognition of the real on the ground . Hi Blink. I agree with you. Those ‘oppositionists’ here and abroad that have in the past shamelessly sided with the TPLF should now leave the game as they have absolutely -ZERO- credibility. A traitor to one’s own family may ‘possibly’ be forgiven; a traitor to one’s State will ‘never’ forgiven; and both will NEVER be trusted again. They know who you are! For more than 2 decades, they have essentially bet their souls that the TPLF would destroy PIA/PFDJ and make way for a new power to waltz into Asmara. Even now, fully knowing that that they have lost ALL credibility, they still have the gall to defend the TPLF. It’s like they are dazed, confused and lost in the past. Their time has clearly passed, and it is simply impossible for them to be a factor in Eritrea’s future political landscape. You must hit a nerve. The PFDJ boys are all out to quash your idea. Please stay on it, it’s a great idea. BTW, Dr. Daniel Rezene have already translated Gene Sharp book to Tigrinya. Perhaps now things are a lot easier to smuggle, may sharing it and circulating the book would be a good start. George boy have absolutely no idea that during the DERG, we grew up listing propaganda about the evil American Imperialism, day in day out including repeating slogans, reading slogans in the streets. This is a real story that happened a long time ago in ethiopia. A young ethiopian girl won a scholarship in a western country, and happily she was preparing herself for the travel until the night before her departure, when her boyfriend abducted her and disappeared. Days later he revealed the hideout. In the meantime, the poor girl had missed her flight, and her future was destroyed. Don’t you think that as much as the foolish guy is concerned, it was love that forced him to do what he did, although there was not a shred of love in it, but utter selfishness, foolishness and arrogance. Don’t you think that tplf is doing exactly the same thing by entrenching itself in tigray and telling ethiopians that tigray is none of their business but tplf’s, the real aim being to save tplf looters and abusers of human rights. Where do you think this will take tigray to? She will gradually be cut off from the rest of ethiopia as long as she is not either with ethiopia or away from ethiopia. People cannot live without communicating, trading or living with others (other ethiopians). Tplf wants to close the door and windows on tigray as the selfish guy did to the poor young girl. What will be the end? Before tplf came to the scene, it was only pastoralists who had interethnic problems that ended in death, and even then the killings involved a single person or two. Tplf taught ethiopian ethnic groups what mass killing really means, and unfortunately, it made tigrayans a victim as well. Why is esat so important to you? You are talking continuously about esat extremists and intellectuals, and so on, and you put me among them. Do you think that esat deposed tplf? No, it is the ethiopian people, the same people who deposed HS and the derg. I hope you remember when amharas were accused of less ethnicism and more ethiopianism, unlike tplf. Finally, they have been awoken and they have formed a nationalistic amhara party like others. Who is to blame if they have been pushed into it? Do you believe that berhanu nega and others will bring back a system similar to that of HS or the derg? Nobody will allow the ghost of the past to revisit ethiopia, not tplf too. If there are extremist amharas as there are extremist tigrayans, both are losers. Ethiopia has changed, and she has changed for good. She has no heart for the past . The only thing that remains is to mobilize the people for more change, and to protect the reforms from those who are undermining it. Scared of tplf, even when it is running and hiding within the tigrayan society? What can it do outside tigray? The truth is that tplf is a problem for tigray and not a solution, and that is why the responsibility of the people of tigray is very big. Tplf is a liability and not an asset for tigray, and they should get rid of it asap. And here is the only place you see diverse views that are not encouraged elsewhere . Your comments are an example. Would it be too much to ask you to revise your uncalled for provocation —-labeling “here” what it is not? 1. Eritrea is North Korea. No, it has been upgraded to Cuba since it was open for neighbour’s tourism. ቀስ በቀስ እንቁላል በእግሩ ይሄዳል, hopefully. No, the crumbling had ended. There is little remaining to crumble. “let’s emancipate our people” to build the country. No, this is just Schopenhauer line 1 in “The Art of Being Right”. No. Eritreans have 100% trust in each other. That is the reason no one is doing anything for the imprisoned veteran leaders including the last, BB. I thought I heard Eritrea is being soldered to Ethiopia? If true, this sound like resurrecting HMS (his majesty’s ship). What better slogan do you want? IA never used the word “let’s”. What can one add when Haile speaks? But you spoiled the partying of loyal subjects of his highness the despot. It may continue until the dawn of doomsday when he aging supremo succumbs to the inevitable. Hi Ismail AA. One could add that much needed changes/reforms to Eritrea’s governance will not come from the outside but rather from the inside and certainly not from TPLF sycophants or those that have in the past aligned themselves with the TPLF in their efforts to overthrow the PIA/PFDJ regime. 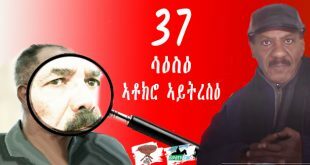 Instead of living in the past, engaging in ridiculous conspiracy theories, endlessly blasting the EPLF, PJDF and PFDJ; it is far more likely that strategies and efforts which acknowledge that change from within is really the only realistic way to effect much needed reforms in Eritrea’s governance. For example, instead of treating the PFDJ and Eritrea’s military leaders as enemies, it would be fare wiser to treat them as allies-in-waiting, in this manner, sections of the PFDJ or military may be motivated to act to achieve their own objectives which best serve the interests of Eritreans as a whole. Strategies and efforts to effect change from within have a far greater chance over time of swaying Eritrea’s public to become apathetic, openly skeptical and even possibly hostile towards the PIA/PFDJ, unless substantial reforms and accountability are implemented. Failure to kick off hangover simply for reasons of propaganda is nausating addiction to TPLF as a factor implicating part of stakeholders in the internal affairs of our country. You and me, and particularly the regime, know TPLF was never an asset in the process of change. The only time it was when the EPLF counted on it to settle balance in the patriotic ranks in 1980-1982. Thus, I agree fully agree with you seeking change with foreign involvement is unwarranted overstatement to put it mildly. I mean nobody is living in the past save the regime and its supporter who do not want to change and risk any sort of democracy and participation. In fact,more than a FAIR and objective as well as a realistic and practical argument and suggestion. It is so simple and straight forward thing but the Inept and the failed Opposition Camp has NO choice but to cry like a bay and blame others as that is the nature of a failed and a weak Opposition. In Psychology,we call it a ‘Transference”,blaming others for own failures. I do not see any mistake or a “wrong doing” by FM or MS to be insulted and cursed simply coz they expressed their views,which apparently,are against the views of the Opposition Camp. -At this critical moment of our history,whether the PFDJ Gov and its Leadership are legit or not,who else could handle the current situation and the Ethio-Eritrea Peace Process and the Agreements and Treaties?After all,wasn’t PIA elected by the Assembly initially? -Our rational and realistic struggle should be to ask and challenge the regime making “Agreements and Deals as well as Treaties” with others,whether those agreements and treaties are or are NOT for the best Interest of Eritrea and Eritreans.If the concern is that all the agreements and treaties are classified,then we have to ask and challenge the same regime to declassify to the Eritreans in a legal,coordinated,organized,united and rational way rather than based on conspiracies and innuendos and in a disorganized and gossip style talk and cheap propaganda. As an Opposition Camp,we are repeating the same mistakes over and over;again and again,and yet expect a different result/an insanity,by definition. -That the PIA does NOT and cannot have any legitimacy or capacity to put Eritrea on sale over night or federate or confederate Eritrea out of blue. The above can ONLY be executed and achieved by “A Genuine and well monitored Referendum by and ONLY by the FREE WILL and CHOICE of the Stake-holders-THE ERITREAN PEOPLE! But to use this Peace Deal and the well clarified Pillars of Agreements and Treaties on a white paper as a Toxic Propaganda against the PFDJ Regime and as a mere PR gimmick and as a a smear campaign as part and parcel of the same old and obsolete defamatory campaign against the same regime,which has survived all kinds of tsunamies against all ODDs and which outsmarted its an uncountable enemies and which came out as a Winner and has stood TALLER and STRONGER by burying 10 ft down the same enemies,then we are just repeating history through repetition of our failed modus operandi and strategies. it would be way better and constructive for the Opposition Camp to do some self-reflections and self-evaluation and to come up with new Strategies and Modus Operandi so that the silent Majority inside and outside the country can be unified and encouraged to struggle better in an organized and coordinated way thereby (to) expedite the change we have longed for. But just talking and having a street fight and gossipy style arguments and writing millions of Metaphysical Articles and Commentaries on the Cyber Space ain’t going to do the trick,NOT at all! So,can we do BETTER and if so,how and in what way? An excellent point. That’s what some of us have been saying all along. We have been ridiculed for saying respect Eritrean sovereignty. They have not said or done anything more than the average Eritrean is asking in terms of democratization. Eritreans are challenging government officials in Asmara as we speak. What these self-congratulating folks have additionally done is teaming up with TPLF in harming Eritrea. And for that they want us to respect them!! No way. They have to repurpose their tools and sober up first. Change is inevitable and it will be driven by Eritrea’s domestic realities, owned by the people. PFDJ has no option other than introducing changes. Reasonable people should push for that. Agree with you on challenging the regime. To start with I propose to put chains on our avatars as I did on mine and keep it till the prisoners are freed. Great iconic image! Anything that brings the injustice to visibility is good. 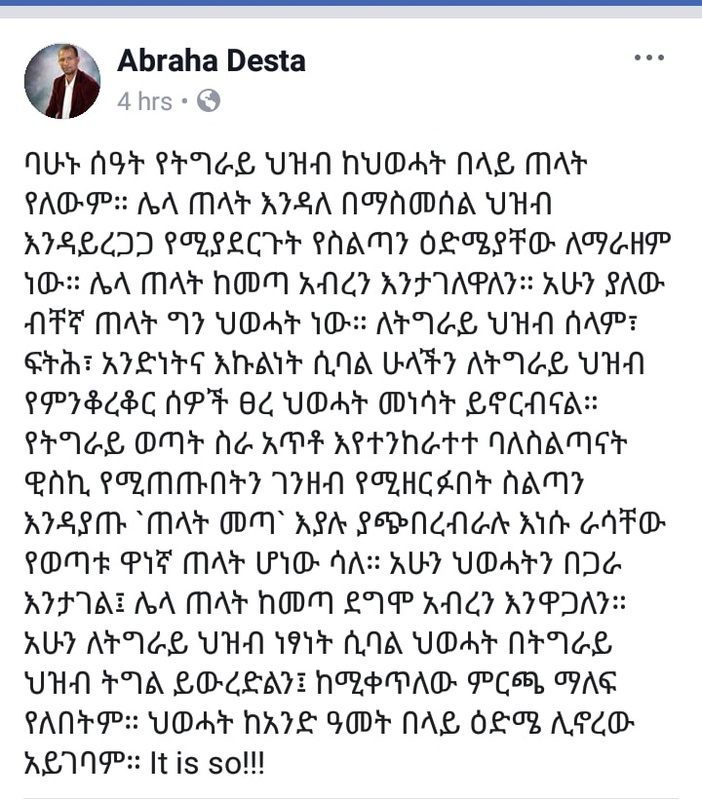 Dear Berhe, It is fair to assume PIA is already incubating some TPLF as a hedge against Abiy, Oromos and Amharas. But watch out when debating the characteristics of TPLF with PFDJs. 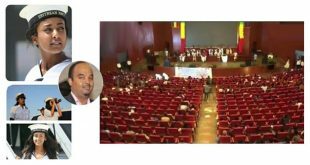 They are not interested in the debate, they just want to corner you into whatever 10% ‘positive’ that you may say even if 90% of your description of TPLF is ‘negative’. Hit them with the true charters of PFDJ and move on. The other day a buddy of mine sent me a video clip where Isaias and Debretsion hugging and laughing right the day Isaias came to Addis for the first time. It was certainly an aha moment for me as Muhamuday came to mind who shudders with disgust at the mention of the Weyanes much less to kick it off with any of them in hugs and smiles. How was fishing? When you absent for a while and comeback, I always think of the long-haul fisherman who go away for days. And when MoKsi-TG goes away, I think of the north american squirrel (ምጹጽላይ) who hibernates as soon as the cold comes. Mahmouday will be back (he already started today) from his paroxysmal feeling as soon as he realizes Godot is not coming. Hi Paulos. 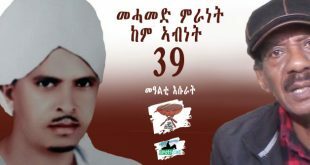 If I see poster ‘Wanted Dead or Alive Reward for Getachew Assefa’ -$100,000 Reward- I’m gonna first visit your house, followed by Hayet Adem, who might be busy at this moment trying to hide him. 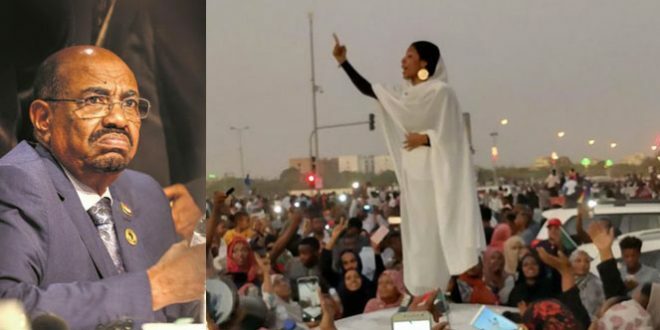 ” Eritlreans are challenging government officials in Asmara as we speak”, with emphasis on the last three words, sounds authoritative statement that could be graded up to a guru’s paramount status to blow a whistle of an endowed knowledge of whate is to come. It could have been reason enough to celebrate if you had added a few detail. Hi Ismail AA. What do you want? Obviously sensitive information on names, places and events? Are you trying to stifle efforts to encourage governance reforms in Eritrea? Problem is that your crew sees NO option (nothing in-between) other than a complete overthrow of the PIA/PFDJ regime, which has an extremely low chance of happening, and even if it did, it could have disastrous results. And who will you put in power as a replacement? That is why you guys absolutely will not engage in discussions on how to effect positive change within the current PIA/PFDJ structure. Maybe better you spend your time giving up-votes to Paolos and Hayet Adem. You have stained the forum with irrational ideas. Man, give me one, only one positive initiative from the regime you seem to defend. My friend all Eritreans dream for change except Isaias and his cohorts. Let Isaias take one positive step towards solving Eritrean problems and putting Eritrea in the right direction, and you will get entire Eritrea takes ten steps towards the regime. All the power of change in Eritrea is in the hands of Isaias and he should initiate the change that is required for the country. My friend, Eritreans never accept slavery even if they are million times weak. Eritreans are stronger today than a year before, they knew their enemy well. The husk from the grain differentiated clearly even to the blinds like Hawan, the derbis camel. Hi Hameed Al-Arabi. Do you even consider efforts to engage the PIA/PFDJ regime in order to encourage positive government reforms? Or, are you simply for ALL OUT overthrow of the regime, in which case, who do you propose to take over? A simple question! Well, your opening statement is even more amusing than MS ‘s was; in your case, the sense you project is that quite a ground has been broken, and that I ventured to entice MS to walk me into the fence next to sensitive terrain and put ” names, places and events” at risk. From what I know so far, you and I are not naive novices debutting to find places in the politic of our country – each from own perspective of course. All I wanted from MS was to make his bold statement a bit believable because if what he wrote would in fact be true, it would amount to making Ato Isayas’ infamous prophesy that the “sun would rise on Badme from the west” come true. Moreover, your notion that change without Isayas and his lieutenants on board could be an omen for turmoil (disaster to borrow your verb) is a ploy rulers and power wielders peddle to frighten and make themselves indispensable. It’s a real concern why one should think the Eritrean people are incapable of producing leaders and fate them to be dependent on leaders who have been tormenting them for decades. We heard such subterfuges during the time of HS, Mengistu H., Saddam Hussien, and now from mouths of regime surrogates. With due respect, to read you playing such a worn out tape is a bit conserative to put it as lightly as one can. As to your generous suggestion for me to spend my time to up-vote Paolos (sic) as well as Hayet (sic) Adem, this brother and sister get commendation they earn through their intelligent contributions regardless of their opinions to which they are entitled to the level you and I do. Hi Ismail AA. Hey buddy, If in your honest professional and intelligent judgement Paolos and Hayet Adem’s comments ALWAYS demand your upvote, what can I say? Other then raise your fist and scream heil TPLF! Hi Ismail AA. If Isaias and his lieutenants are removed will you then be willing to work with the remaining PFDJ structure or are you advocating complete overthrow of the regime? And again, in such case, who do propose to take over the reign of power? You guys always seems to avoid this question or respond in vague terms. You have wrongly indicated that I have said ‘that change without Isayes and his lietenanats on board could be an omen for turmoil’. I have instead said that a ‘complete overthrow’ of the regime could have disastrous results. I have said before that I am not in favor of any leader in any country or context being in power for longer than 10 years much less 27. You keep on asking who would be put in power after removal of the current ruler. The reverse question, too, is why should the Eritrean people be required to put in standby position a ruler or rulers! The demand is more of replacement of a lawless order by an order of rule of law than a person or even a group of any formation. A catalyst leadership and guiding programs that can bring the situation to that point would emerge through the process of change once national ranks are closed and resolution is made to get rid of the despot. Moreover, sir, no sensible justice seeker would be so mindless and consider segments of our population who are counted in camp of PFDJ as enemies. If that would be the attitude, then the projected change would lose an essential purpose and meaning, namely, and as I wrote a few lines above, justice within an order of rule of law would casualty. Here though, it should not be taken that wrong doers who tormented innocent citizens and unfairly used power to squander the meager resources of the nation and caused unimaginable suffering to the people – young and old – would not be accountable before rule of law in under fair justice system. It is a fact however one might look at it. I am not going to give you scoops as that is Kibrom’s forte. Where are you Kibromay? I miss you. For the first time, the line dividing Eritreans on what to do is blurring. Apart from the die-hard lots of the so-called opposition, Eritreans are coalescing on the idea that we must move on with our domestic agendas while monitoring the turbulent situation in Ethiopia. What is even more promising is the fact that the leading promoters of this ideas is from PFDJ itself. And the leaders appear to be apprehensive of the need to reform, I guarantee you that. It may not be as quickly as we would want it to be or as not far-reaching as we would like it to be, but it is coming, totally dictated by Eritrea’s objective needs, driven and owned by it. REFORM and TRANSFORM is the currency gaining momentum at this time. Transform the country to post-war phase through a process in which Eritreans of all walks and political stripes participate. To that end, we must encourage communications across political divide-lines. I admire and appreciate your sense of optimism but not sure if it is based on realistic scenarios. Reform and Transform you say, and could you please expound on that as what is to be reformed and transformed? Much obliged. Certainly he stacked his ideas on the Enlightenment thinkers and Classical Liberalism alike where the fundamental trajectories were Natural Rights and the reign of Reason as well but he went on to argue that, political freedom is the basic foundation for development. When his cases in point were most developing countries in Africa and Asia, Eritrea can not be an exception either where if we are to talk serious, no amount of reform with in PFDJ can cut it if there is no a fundamental freedom on and for every citizen including political freedom, freedom of speech, freedom of assembly among others. And the supreme reign of Rule-Of-Law as well. You are something. I heard about the guy when he won. I didn’t understand to the detail you out but understood in simple way. Basically, no democratic country would go hungry or something. There is nothing to reform in PFDJ and IA land. You reform if there exist something. PFDJ have nothing except IA and his security apparatus that obey and execute his orders. Isn’t that what the G13, G15 and others tried. Isn’t that what Andebrehan, Wedi vacarro and others tried. Isn’t that what Berhane Abreha tried? The only reform means to PFDJ is to right letter of apology and submit. The only reform that would work that I think of, IS to pack and leave to Saudi Arabia. I remember back then, the guy was owning the days and of course for a good reason. If we straddle between economic and political realms, it becomes less harder to conceptualize the fact that reforming PFDJ is as you have sardonically put it, ሕልሚ ደርሆ. Where you and I live, we have anti-trust laws where companies are discouraged from getting a monopoly of their products. That is, they are not only discouraged but they go through rigorous regulations as well. Here is where economics and politics intersect: As much as the State is the only entity with a legitimate monopoly of power, can or should it be regulated? If it should, how does it get regulated? Well, the answer to that is, political institutions such as Rule-Of-Law regulate the State. Now the question is, if there are no political institutions in place in Eritrea, how does the State by extension the only political party—PFDJ gets reformed or regulated? The answer to that rests precisely on what the Catholic priest Abba Teklehaimanot put it in Segeneity when he said, ሓድሽ ወይኒ ኣብ ዝኣረገ መስተይ’ ከነቐምጦ ኣይንኽእልን’ኢና! Much appreciated. I will try to expound on it in a different format. Will let you know, a bit squeezed between two forums plus my day job. Fine that you cared to sober the statement that caught my attention and led me to scribble a comment. I am sure Kbrom would not be mean to share what might be reasonably credible to be shared. What you have reported in this post fits a condition in a raging ocean of concern through which a population in duress has been struggling to wade through due to unbridled despotism. Many of us do follow things and take notice of random talks through looking from household premises can make a difference from trying to make sense of things from neighbourhood vantage points. But the billion dollar question is that, under the well known circumstances in the country, what you and many brothers have nowadays are talking about fall on the mind either as border less optimism or cleverly executed grass roots salesmanship of targeted propaganda. Anyway, let us wait for your thoughts about the two notions you stated with anticipation of on which of them you are going to square on. Wishing the culprit to rectify his own follies and aspiring level field process sounds misplaced notion. Selam FishMilk, I think there is one very important issue that many of us who are in the diaspora seeking for a change in Eritrea ignore. It is the fact that most government officials in Eritrea were tegadelties who depend on the salaries they get to feed their families. I’m sure most of these people do not have any qualifications with which they could support themsleves, should they lose their current positions. Also, I don’t know of any pension system the day they are old and out of jobb. I think they think the day the current regime is gone, there is no way they could put food on the table for their families. It is in other words a matter of survival for them that the regime, irrespective of its shortcomings continues. Hi Abraham H. I agree that it is an issue to be considered, especially for a Government that has been in power for so many years. You put emphasis on the principal culprit of the eritrean situation, i.e. the cause of absence of significant dissent and apparent 100% solidarnosc among the EPLF Tegadeltis. The non-dissolution of the movement to real civilian life (with only apparent change of face from eplf to pfdj) is not only the main reason hindering changes, but also the reason why their comrade prisoners are being kept as prisoners without facing court. That is the reason the average PFDJo were given as an answer to provide when faced with questions. They are still tegadeltis and are bound to the tegadelti rule of law. We are not yet out of Ghedli! The new PM of Ethiopia is also challenged the way you are. His clear message to the oppositions in their first ever democratic meeting is we must to have first a country then democracy or whatever a country needs. He underlined that those who are extreme and want to impose their will on the rest of us or those who wish well and expect Ethiopia to achieve the democracy the civilized world has reached overnight must come and meet somewhere in the middle. No more killing or engage others who are emotional to to kill others. Lets discuss, he said. Coming back to the point Eritrea must stand as a nation before everything else. The list you mentioned above is what part time oppositions use against their own country just to make their point loud and clear. But what they dont know is that they think they can control Tplf by remote control after tplf CHANGED the Eritrean government. Late alone ‘we are fearless’ on cyber even tens of thousands life sacrifice, 2,5 million internal displacement, hundred thousands in jails, in human torture against its own people have not stopped to destroy Ethiopia. What made the part time opposition trust Tplf to change or win the government of Eritrea that it gives the democratic Eritrea on silver plate bites me. Or they have planned more list to write down and scare woyane in case the new puppet Eritrean government supposed to be made by Tplf disappointing them. Anyways the crazy war of changing the neighboring government has been won by Eritrea successfully. As an Ethiopian I should have not be proud when Eritrea wins against EThiopia. But this time Eritrea wins for both of us to live in peace. I hope it is a good lesson for those who have the potential of learning from mistakes. The part time oppositions who found out their remote control destroyed are now in sorrow. They are so sad by the lose of tplf they even become angry that the peace which made millions Eritreans and Ethiopians jubilant. The only thrust they have now is talk about how the peace brings Armageddon to Eritrea. First let me say that, what ever happens in Ethiopia is the interest of Ethiopian people. As a part time opposition, I have no sorrow to see TPLF removed from power and that it no longer have the power to threat Eritrean sovereignty. This blaming opposition and the sorrow the feel because TPLF was removed is pure lie. Instead of painting with “part time opposition”, it would nice to spell out who exactly is sorrowing. Second point, the peace that was achieved between the two people is a very good start and I personally (and I am sure many others) would like to see continue. Third point, please understand the difference between IA and his PFDJ gangs and the Eritrean people. Since you are comparing Eritrea to Ethiopia and what Abiy has said to the opposition how they need to have a country before democracy. 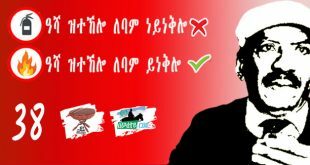 It’s a noble idea and I can tell you I agree with him and good luck to him, the opposition and the Ethiopian people. Now the final point and I hope you take some time to understand. In Eritrea, what you call us “part time opposition” we don’t have any luxery even close to 1% what you have in Ethiopia. I will give you few examples. 1) An elder Eritrea 93 years old, who was head of the school board, was put to jail and forced to die for speaking out agaist the government forced policy and interferance of the private school. 2) A young girl of 16 years old was put to jail (6 years now) because her father (former minister) defected. Not only her but his brother and his father as well. Three generations. 3) A former minister and a veteran of the armed struggle who was IA enforcer who was living in the UK died. His last wish was to get buried in Eritrea. IA refused his burial and the family have to keep him in morgue for 6 months. His daughter went to see IA and begged him (not sure if he met her) but come back empty handed. He was burred in the UK. 4) An Eritrean veteran and former minister was put to jail with the rest of the G-15. He was a father of 4 children and his wife also a veteran of EPLF was in the US doing her masters. She returned to Eritrea to be with her children. While her children and her mother was waiting for her in the airport, IA security come and took her before she even had a chance to hug and kiss her children. She has been in jail for over 15 years now and the father since 2001 (17 years). she left the US, her friends asked her what if you are put to jail…and she said “Please tell the world”. 5) Two Eritrean veteran (one former interior minister and vice president) and his wife high official within the government are in prison since 2001 for writing open letter to the president asking him to convene regular party meetings. Their son never have not seen both his parents since 2001. 6) A Dr. and teacher from Kunama tribe (one of the very few) who was also a veteran tegadalay is put to jail and never heard since 2001 with the G-15. They are disappeared from the face of the earth….never to be heard from…. You are free to comment, and insult us “part time opposition” as much as you like and wish. But I want you to understand our sorrow and our betrayal of our government. What would you do if your daughter, your father, your mother, your uncle, your grand father, have disappeared from the face of the earth and never to be seen and heard before. What do you expect us (part time opposition) to do please? You are a keen observer to EPLF/PFDJ lies. We were told back then that everything they do including lying was for the welfare of their organization (ንሓልዮት ውድብ) and not for the welfare of the Eritrean people. Imagine, It had never in my mind that policy will continue when they entered the city. But they continued it in their governing policy. First they transfer the property of the organization to their party, instead to the “state”. As a governing party, they monopolized all the manufacturing industries, however small it is, and including the human productive forces. In short their struggle was and is for the welfare of the party and its members. So in their book lies is always “ሓልዮት”. Hi HaileMW; well sorry you are disappointed that PIA wasn’t pulled out from fox-hole by your masters TPLF goons. When you and your likes talk about Eritrea, there is nothing to do about Eritrea and it is people but all about revenge, it is all about grudges and it is all about Eritrea must be humiliated by TPLF. Sorry it didn’t work that way. It seems TPLF is on the run. No worries, once your TPLF is gone and no more threat then Singapore of Africa shall be commenced. By the way how Mekele? your writings suggested straight out of Mekele. Good luck with PMAA he is coming for you. how are you doing my man ? I really hope PMAA is comming for me… at least i will have a chanche for a fair trial, Immagine if it was Iseyas the gondere, I would have disappeared in one of his fox-holes like many eritrean Heroes. Nitricay can I ask you why are you still obssesed by TPLF ? aren’t they on the run ? isn’t it “Game Over” ? you never speak about eritrea. You are obsessed with PIA and TPLF just like the fano Boys… i suspect you are Oromo, by the way did you learn tigrigna ? your amharic is impeccable but your tigrigna.. Anyway; back to my toothless prediction. The reason the second part of PIA’s interview postponed is because the it is reserved for special day and purpose. The 2nd part of PIA will be aired in New-year day and it will free all political prisoners and the road map shall we be drown. in short; the beginning of anew!!!!!!! We need our chopper back. We have some high profile thieves that need a quick and comfortable transportation. The gold chain on their wrists need extra care. Rass Abi; not only we oblige to return your helicopters but it is our pleaser to paint them Yellow color as well before we deliver them. “PIA brought down to their knee” that’s funny. don’t give credit to the Ethiopian people, don’t mention PM Aby nor the people who made it happen, no! way it was PIA. You are just insulting all those who really fought hard and died to bring change in Ethiopia (their country) and got rid of the TPLF regime. It was PIA who won the TPLF LOL. Abi (not the prime minister) can confirm it. You are hallucinating my friend, I hope your predictions are going to be right tis time arround thou. Hi Haile WM; I don’t think you understood the real beef. What Ethiopians did to TPLF is their business. What happened between Ethiopian and Tigryans. but there was a bigger beef between Eritrea and Tigray. Tigryans came with everything they had; including getting the support of Amara, Oromo and the rest of the Ethiopia’s money and man power. guess what who is intact and standing? Translations? There was a fight to death between TPLF and PIA and PIA is rooming allover Ethiopia while TPLF imprisoned in Mekele and the time they tried to get out of Mekele; well there is a yellow helicopter to pick you up. So, get this to your head; PIA defeated TPLF for ever and ever. Game-over!!!!!! 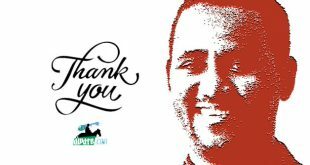 We are grateful that Isu rooming all over Ethiopia because he stood with the majority of Ethiopians and has been part of the struggle to quarantine the killer virus of our region by the name Tigrians People Liberation Front. But Ethiopians must work hard to protect not all Eritreans are like Isu. Equally deadly virus like Nitricc must be identified to protect Ethiopia’s unity. Mitiku; don’t undermined Eritreans. You should know in first hand. PIA is rooming in your country because he defeated you once again. I don’t if you are paying attention but PMAA is loyal servant of PIA. the truth but being donkey as you are, you won’t get it. stupid. The Isayas who believed tplf learnt the hard fact around 1996. Except tplf millions Eritreans and Ethiopians lost both innumerable human and material resources. As far as Ethiopia concerned Isu had paid back for his wrong doings in helping Tplf. But that doesn’t mean poisonous snakes like you will leave Ethiopia and its unity alone. You lousy paranoid lumpen will not sleep before Ethiopia dismantled and become a mother of all civil war. What prohibits you is dirt scumbag like you have no acceptance both in Ethiopia and Eritrea. You have only one option. Pray Debretsion declares independence then you can join to full fill your dream. i Thought you were saying Badme Badme bla bla bla for the last 15 of so years and now your priority seems changed huh ? “..I am going to Waite for the 2nd part and see what he says. wake up Nitricay general abba Arre smell the coffe, it’s time you identify the real enemy of Eritrea. Hi Haile WM; Why are you undermining the contribution of Eritrea and PIA to the Ethiopia’s change? Eritrea gave shelter and arms for every person who opposes TPLF. The heat against TPLF came from every direction thanks for Eritrea. once the platform was set by Ethiopians in Eritrea then the Ethiopians took it away the end. Do you think this change could happens if TPLF was partner with Eritrea? NO! Sure the change is done by the Ethiopians but there was a greater force that helped them to be were they are. There is one evidence that suggested that is the truth, that is while PIA demanded every opposition in Eritrea should be included in the change; PMAA did nothing about the oppositions in Ethiopia. in fact PMAA told them to stop any activity or to leave the country. First of all, I want to make it clear without any mask or veil to the camels at Weyane pastures. The motto “WEY MOT” doesn’t exist in my dictionary. WEY MOT is a slogan for those who lack principles and values such as of justice and human rights. When you speak about others never count them to your size, you are merely tailored to fit the Edaga Skunis. They have designed you to be pulled like a camel loaded with their junk through your entire life. Hawan was addicted being a debris camel (ገመል ሃነሽሽ). It is very difficult for him to serve in an alternative job or circumstances; he was swept away beyond recover. Weyane is dead, turned to a corpse, and abusing dead bodies is only the works of Skunis. A sane person buries a dead person never looks back to abuse it. Weyane game is over, the problem is the live dead corpse who are unable to digest that the TPLF is done. It is impossible for Weyane or a Tigrai party to rule Ethiopia at least for the next hundred years. They have taken their time, but didn’t utilize it properly to win hearts and minds of all the Ethiopian people. The most loved Weyani green pastures are a valuable gem in the hands of Edaga and Biyassa Skunis. Edaga Skunis harvested from it a lot of benefits in the past two decades, and lately has joined them the Biyassa Skunis. They both have begun to attribute their failures to build strong infrastructure and advanced democratic institutions to Weyani pastures. The cause of any lightening and floods that occur in the country is the TPLF green forest. They ascribe border demarcation delay or dam construction halt to the same forest. It is a never ending attribution project that holds dictatorship alive or a mild method that leads to a full blown dictatorship. Really, it is a good way of distracting supporters of regimes in the poor countries. In June 1991 after less than one month of the independence of Eritrean, I met an EPLF cadre named PHARAOH who I discussed with him about the new situation and how to be handled. I told him that now Shabia should call for a national reconciliation that comprise all Eritreans. He replied to me that those FRONTS at the border we will chase them (ክንጋየዮም እና). I told him, “I am afraid your chasing will continue” (ኣነ ይፊርሕ እቲ ምጉያይኩም ከይቅጽል). It seems Dr. Meddamar main concern has become chasing opponents instead of building strong democratic institutions and modern infrastructure. As far as his principal attention is the MARATHON of chasing opponents, he is definitely heading with Ethiopia to dictatorship and a failed police-state. I think the people of Ethiopia are in need of building their country not of chasing opponents. If Ethiopians want a developed country, then 99.99% of their time should be occupied in building their country or they will end up in the Weyane pastures with Hawan and a dictator in Biyassa. You have a good example in Eritrea, the MARATHON that will never end. I hope to learn from it. I hope brother Semere Andom to issue a judgement about my prophecy, THE MARATHON THAT WILL NEVER END. You can say what ever between Eritrea and Tigray, but to say they stole land from Amhara people is not a wise comment. Who is stealing a land from whom and who belongs to which side should be Ethiopia’s concern. We may hate them, they may did bad things against Eritrea but say such a thing is a prejudice. After all they were our neighbor, they are and they will be for ever whether we like or not. We can accuse them in whatever case that they do against Eritrea with facts and evidences otherwise we are planting hate for future generation. Meles Zenawi and his party had good opportunity in the 2005 election but the hidden agenda spoiled for all of us. Already in 1991 Tplf/Meles could start with Ethiopian development Organization but the hate for Ethiopia Tplf has had spoiled for all of us. Now Dr Abiy must think not to repeat the same history. Meaning spoiling his and his party success. Specially if he and his party continue this democratic miracle journey in Ethiopia, some real parties can make a coalition and win Dr. Abiy. Ethiopians must not loose Dr Abiy by hook or crook. So the best thin for all of us is Eprdf must ditch the thief and cruel criminal party by the name Tigrai People Liberation Party. Why associate oneself with this criminal gung which calles itself rebels. Dr Abiy has a good excuse. Since the new revolution Tigray and Tplf is against him. The rebel government of Tigray ignores both the PMAA and justice minster. Thieves from all Killils are hiding in Tigray. There is no better excuse than this to ditch Tplf. It is said that non-violent revolutions bring democracy, while violent revolutions end up in dictatorship. The later is characteristic of tplf. PMAA has a very good chance of bringing democracy to ethiopia and he is on the right track. He seems to have played his cards very cleverly by snatching the army and the security from the hands of tplf, thus strengthening his power andat the same time incapacitating tplf. Moreover, he has garnered approval from the opposition parties, who seem to have accepted the fact that the political reform should be defended not only by the pm, but by all parties as well. As much as tplf is concerned, it has a choice to make, either to remain as it is and wither away gradually by turning itself into an insignificant and irrelevant small regional party, especially if it excludes itself from the eprdf, or cleanse itself deeply and remain part of eprdf, or disband itself and form a new party with other tigrayan parties, although the ideological gap between them seems very big. Tplf should cleanse itself, but also change itself, if it wants to avoid ending up in the dustbin of history. It is not food assistance. It is looting. I am not angry and I am not defending TPLF. I am happy, elated that TPLF is no longer calling the shots in Ethiopia. If you don’t remember, I thought TPLF long term plan was the disintegration of Eritrea by citing civil war against each other (millitary support for Afar and Kumana) extending the no peace no war forcing Eritreans young to leave, so they have the upper hand to dictate and force a political party they support and impose their ethnic based politics (upto succession, I met an ERITREAN opposition guy who is close to his party leader (Hansen’s, I think his name) who was with the opposition based in Tigray, who argued with me the upto succession into our constitution and breakup Eritrea and some to join and incorporate them. So as an ERITREAN, I am really, really happy to see them go. I said the best thing about the peace with Ethiopia is, people like you who were die hard supporters of TPLF can’t take us to WAR any more. And it makes the fight against IA better. What I am saying is, even the TPLF generals who are accused of crimes, corruption, deserve a fair trail and the ability to defend themselves. I am not saying they have been denied, but the public shame, and concerted efforts makes them guilty without proper legal proceedings. And this is dangerous for Ethiopia and Eritrea by extension. As far as I am the only person defending, I don’t think I am but it will not surprise me. It will take a while for slow person like you to catch up:). Thanks for the soccer match tips. Speaking of soccer, I am going to watch CANADA U-17 semifinal match in Uraguay today with my daughter and her team/ parents. Actually it was good week as far as sports goes. I watched on the weekend live the African cycling championship in Asmara and you should see the highlights if you haven’t. Ethiopia have done ok overall. I know you are bored reading this but I want to write for the last time including to your country man Teodores, and Hope gergeru. If I said to your hate towards Eritreans is understandable but that would not be fair. The problem with you is your have no principle, you stand for nothing. Weren’t you arguing with me and many others because of the love you have for TPLF and the hate you hate you to PFDJ and IA. For the record I am not defending TPLF, they know how to defend themselves. What I am saying is the sane thing others have said, all this, one love, Fiqir yashenifal does not turn into something else. I think saay like to quote Serray “Isayas Afeworki has the reverse mides touch. Everything he touched turns into ash”. Why u want to drag Saay with this kind of trashy conversation? am sure Saay didn’t used those words to make trashy point like ..do. Saay is exceptionally brilliant person, he is rare in that part of the world called horn africa. I just saw one of his speech in aida facebook. Where is he now days? Obviously you didn’t get what I am saying. No question about saay exceptionalism. I know what u meant. It is about league, if the horn region is a normal place, am sure Saay is playing in a very important league right now, like ministerial or even pm level . I know some of the people in ethiopia new cabinet. am just comparing u people, them and Saay. I was urging him to be our leader twelve years ago. He told me he does not like and want to be in politics. He likes to write. I have not see the Facebook you are talking about but his speaking ability is even better than his writing. He is quick, he is articulate, he thinks on his feet and he has sense of humour. If it wasn’t for ERITREAN politics and he does love education, I imagine that he would a university teacher or something. The Aristotle kind of teacher. So you think IA and EPLF are Eritrea and they can do anything they want to Eritreans? yes or no? I will belittle, IA, the PFDJ and the Eritrean Afeworki, all day and every day and twice on Sunday. I don’t know. If one TPLF official looted 10 billion and stashed the money somewhere in Swiss how can you blame the people of Tigray for not developing? What is this billions of dollars that people throw freely anyway. Does the west do stupid they will just hand them over to steal it? Every project has phases and milestone that needs to be met before funds are released. I suppose the same for the Chinese loans. They will not just throw it freely. As to the technological advance, I don’t know in what sense. There are handful countries who are really lead in technology, and rest of the world just use their invention. The US, Japan, Germany, Russia may be Italy after that, now add China. The UK, France, Canada, I would not even consider them advanced. They just import products use them for the most part. Maybe Sweden, at least they have IKEA. Israel gets lots parents for such small country. I am not thinking Tigray will be advanced that they will go to Mars. But good enough to bring jobs and improve their standard of living. I posted several reposne to you in which, you either totally went off Mark or did not understand them. a. That is really generic statment. What does that mean? the leadership of tigray is in the rirght direction? they can develop? Food security is basic…you know! 2. Isreal main export is not Software. Google it. government empty barrel. When in fact it is the opposite. Admiring others doesn’t make or mean that it’s belittling your own. Again for 100 times. PFDJ and IA, and the Eritrean government are not equal to Eritrea. Do you get this? The government of IA bury people alive or leave them to die in a cell without giving them medical care. 1 our of sun every 24 hours. This are not just ordinary people but Eritrean hero’s. Do you want me to LOVE such barbaric government and Haradi Seb called president. If you want to compare yourself and PFDJ with TPLF go right ahead. But please tell me any opposition leader or government official who they made disappear from the face of the earth? Please name one person. I am not saying they didn’t kill people or torture people…NO. I am not NOT. Who know how many Eritrean have disappeared by the PFDJ government. According to the UN Human rights and the testimony of Eritrean, hundreds of thousands…4 thousands pages of written testimony of Eritreans. “You belittle Eritreans”. It’s endless arguing with you. That’s really cheap. What I am worried is the fire the people you are supporting going to start and that will engulf Eritrea. It shows justice means nothing to you. No wonder you worship IA. It starts with 1 and it multiplies. The British had Habeas Corpus in the 1600s. Right to a fair trail, nota trail by the media. I think he is trying to say , no musilm minister during derg and Hs time. mengistu h himself was an oromo from his father side and “kim h” from his mother side. Ok you are entitled to your opinion. I have seen many of their meetings including with their government officials, the type of questions they ask, they type of freedom they have, the type of independence they have is truly great. 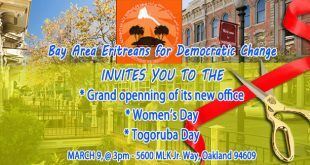 You never see this type of open and free meetings like that with the PFDJ officials. Specially in the last 18 years. It’s the officials talk and everyone listen. And those that ask it’s usualy on the same line of those government officials which reinforces what they are talking about, but never challenge them. And those who can ask questions are usually, the opposition but they are either not inside (demonstration outside) or they don’t bother to go because it’s useless. Please share any video that proves otherwise. I never belittles Eritrea. Never. I belittled IA and PFDJ, which are not equal to Eritrea. I have a feeling that you know Eritrea from the yPFDJ propaganda brain washing seminars. Non sense topic, Eritrea vs the world. Great! I think we have observed the same thing, in that…..
1. That they have a lot of youth, men and women in there early 20s and up very articulate. Have a good grasp of the challenges they are facing. They are very aware the mistake that was done by their leadership. But I need you to a little bit of careful. What unit is about show not action with that in mind I want you to consider the following things. cadres..pretending to be opposition and controlling the opposition scenario. Or it’s known as controlled opposition. case you don’t know in the last 20 years they have trained a lot of cadres. B. It’s not unique to them. I also have watched amhara meetings. They are also equally articulate and good grasp for the challenges Ethiopia is facing. As a matter of fact I think they are better because they are grounded in reality. The tplf sounds to be a little bit arrogant. C. Having said that I think TPLF leadership has lied to its people about many things. For example they habe told there people that they are the main reason derg collapssed, they are single-handedly responsible giving Eritrea its freedom. And that they develop Ethiopia. In other words they believe their own lie. That has given them a false sense of pride. You can see how this can be a problem. 1. Do not underestimate… brush off, dismiss their determination to create greater Tigray. It’s the ultimate goal. They have not give up on it. You might call it crazy you might dismiss it but it’s a serious matter. It’s not an issue that only concern Eritreans but it also concerns other Ethiopians. That is a fact, I’m sure you’ll admit that tplf is a reckless organization. Not only is reckless, it is short-sighted. It has shown over and over to be deceitful untrustworthy organization. Irresponsible. Reckless people can cause major problem. Look no further, look how they delaying the demarcation. Referring to eritrea’s foreign policy you minimize our concern by saying ” …us vs the world….” it is really disheartening in this day and age when he have ample evidence to suggest otherwise you choose to mock eritrea’s struggle to be independent. Again here you choose to ignore the fact that is pretty much universally known. That the United States interfere domestic affairs of countries whether they are Democratic or not. The end result is is not positive. You can forget Eritrea for a second if you can go look at the history of Iran, Guatemala, El Salvador and Honduras. All of the countries I mentioned had leaders elected democratically and supported by the populist only to find out they were flipped by CIA. Before you dismiss it in your trademark attitude. This all the crimes CIA openly admits right now. As a result of CIA action those countries faced massive suffrage for decades and some of them still facing it. Here I’m not saying we should pick up a gun fight United States. They’ll be a futile attempt. I’m just saying you need be, all of us for that matter need to be aware. You need to put it in the equation of any conversation about Eritrea. We don’t live in a bubble. Spurs have taken over Arsenal as the 2nd best club in London, Chelsea being the top one. Based on yesterday’s performance, our number one enemy could beat any team. Chelsea were all over the pitch. David Luis must have left his boots on Capo Cana. Arsenal are an average team, with very few noticeable classes. We got to accept we can only play a second fiddle to Spurs. The biggest football derby has been cancelled for second time consecutively—The Boca boys are terrified of the Rivers. Where was the whole defense? Spurs should have scored at least 6. For the first time ever I watched City’s game instead of United. I think God loves sports he created the weekend. If you simply do research on Eritrean society and you see the EPLF/PFDJ corruption, expropriation and the abuse of power and the evil… that the EPLF/PFDJ Communist regime has imposed on our society , The entire structure of Eritrean consists of dead end political and revolutionary rituals and militarization ,they destroyed Eritrean society and real Eritrean culture. It’s regime is unfitly utilitarian . It’s beneficial for EPLF/PFDJ and prolonging miser for the mass, IA care only the’s power to rule. Most Eritrean don’t like the extreme left Communist regime of the bygone Era .simply because they’re evil. But what ideology and faith do they really have? What value and faith can the godless and soulless regime possibly have? What fruits did they produce . EPLF/PFDJ knows well ,there is no universal political order without crushing culture and tradition, their objective is to destroy Eritrean society ,their culture and tradition only and to turn Friday and Sunday into a day of state-worship and warmongering . Jesus Peace upon him when he said “You shall know them by their fruits. They’re mixing up everything in Eritrean society and poor people’s heads with empty slogan. Because one have to understand that from the early time the youth were in their early age , they’ve been brainwashed. Replacing well Eritrean values of faith and culture , society can’t continue on that path for long . It needs some healthy and positive force. we need wise Eritrean voices, voices of both humble and clear. So where does that start? It starts in the daily actions of ordinary Eritrean people. Simply put It starts in how they live and organize. How they take responsibility for organizing their lives. My point was simple. In many Eritrean mind and heart, [they truly feel that] EPLF/PFDJ Eritrea model doesn’t have any special contribution for progress and advancement characteristics. It doesn’t offer anything special. And they don’t have high standards. Many don’t realize how few public intellectuals in Eritrea are keeping up the struggle. Few liberal intellectuals and most Eritrean they want is for Eritrea to be a normal country. What dose it mean by “normal?” they just want justice, freedom and peaceaand Eritrea respecting universal human value not to go backwards. Just don’t get any worse, that’s all they asking for in nutshell . Eritrean society, everything that seems impossible or completely weird actually does happen, inside Eritrea intellectual can you not make any comment ? Sometimes, they feel can’t tolerate it—they have to speak out. And if they’re looking at the people in society who are suffering, well, they’re so sad,pitiful. It’s intolerable. They feel you can’t help them in another way, so at least they can try to publicize it and get outside public reaction. In fact, they aren’t really helping them, but they feel they have to speak .Many wrote what came to be known recounting the tribulations of highly educated people like themselves. Sadly Almost all of them were arrogant ,soulless , self-pitying and insipid, produced by people in political system 70th to late 90th by their kind tribal and regional affiliation association , who today regret and were aggrieved by but not reflective about having served a system that killed thousands of people of the their own kind and others . 1) Yes, there is: if those high profile prisoners are released, they may hijack the peace process and further accelerate it–Leaving PIA way behind. 2) Remember what Bereket’s “bombshell” thoughts were on Eritrean-ethiopian possible relations & the years it took for PIA to come this much–a snail movement. Eritrea is on the verge of building a Nuclear bomb. According to survey conducted by VOE, IA is the most loved leader by his own people. Aha, you precisely know what the PFDJites makes them happy, however untrue it is. You are smart. Many of my close friends were pro-PFDJs, some die-hard, some opportunistic and others flow with the wind. 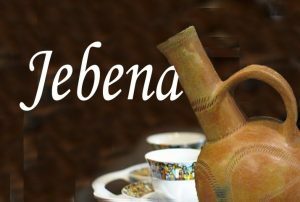 Whenever we went to Eritrean gatherings, my presence had always created lots of headaches for them. I was given either shut up or do not show up option. I often opted for the latter. On some rare occasions, my absence had created some frictions on our friendship as our friendship goes back to our childhood. Therefore, I needed a coping mechanism to survive— so as to speak. The pumping up PFDJs with some out of the world invented stories worked well. I can see their faces and bodies lit and their views towards me did a 180- degree round. I was showered with praises and how a patriotic I was. Deep down I felt guilty as I can see how this nation was going be build with these dummies’ minds. Since IA has signed the peace process, most of my friends do not want to see me and if we pump into each other, we just hello. They feel deeply ashamed, though, in public they show a brave face, in private, they grieve. There were crying our borders for 20-years, now their boss told them that anyone who mentions this dirty word is a traitor. The embassy in London called town-hall meeting yesterday, and initial indication shows that no many people showed up. I met one of them and pressed him to give me some info, but he shrugged and said, ‘Nothing’. So, your reading is spot on.